Some of these pictures are examples of HISTORICAL PAINTINGS. These paintings depict authentic events of early American history. The Currier and Ives picture is an example of a FOLK ART painting STYLE, which is a type of EXPRESSIONISM. True FOLK ART is by an artist with little or no formal art training. 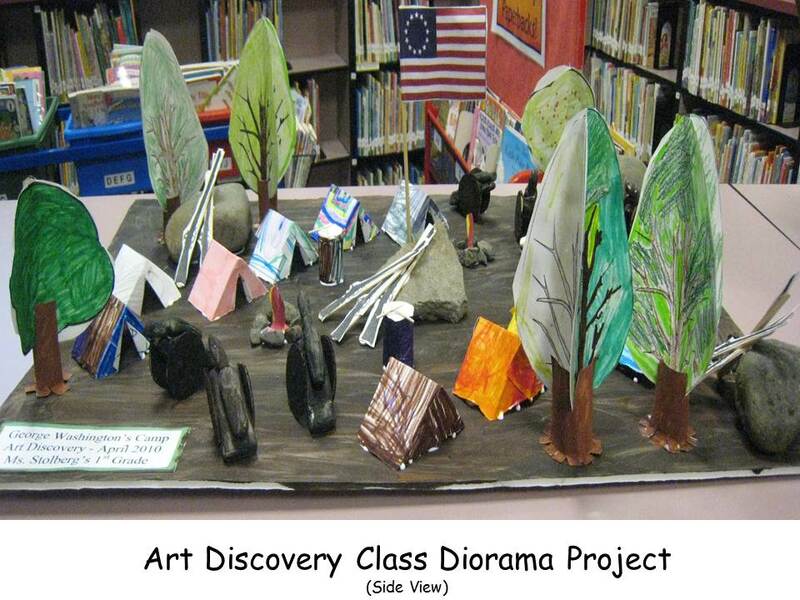 The kids in the classes that you present Art Discovery to are most likely FOLK ARTISTS. Many of the pictures are PORTRAIT paintings. Most of the Portraits are examples of REALISM in their STYLE. Be sure everyone understands the definition of Portrait. Compare the various STYLES of pictures featuring George Washington. How are the various paintings similar? What did Currier and Ives, Roy Lichtenstein and Grant Wood do in their EXPRESSIONIST painting that is so very different from the painting style of John Trumbull, Emanuel Leutze, Howard Chandler Christy, Gilbert Stuart, and Rembrandt Peale? Be sure ALL 10 pictures are returned to the Packet Carrier after your Presentation is finished. John Trumbull was born in 1756. He was considered an American Portrait and Historical painter. Trumbull saw himself as a chronicler, or recorder, of the American Revolution, through his paintings. He knew that America gaining independence from England was a very important part of history, which he was privileged to witness during his lifetime. Trumbull painted pictures that recorded history for the many generations of people that would be born after him. John Trumbull died in 1843. 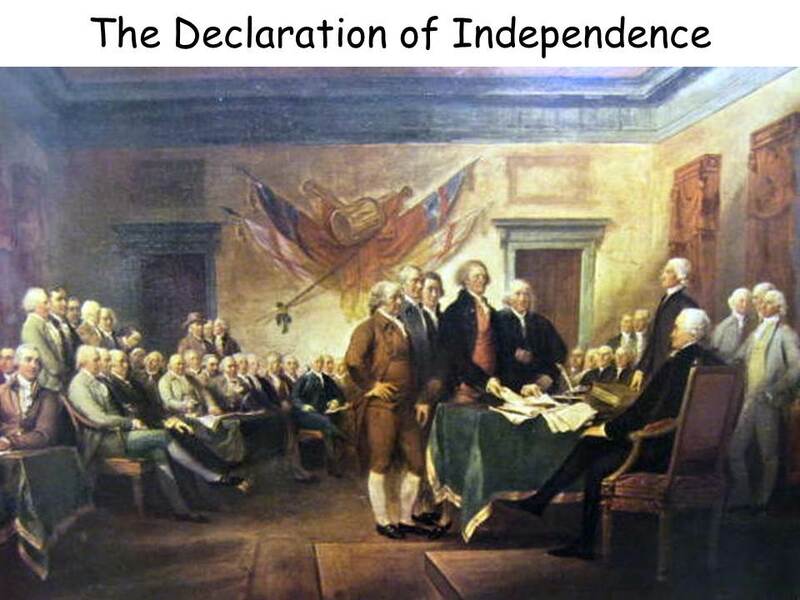 In early June, of 1776, Congress appointed a small committee to draw up a declaration statement that would let King George know that the American colonies considered themselves a free and independent nation. The committee discussed, and finally agreed on, the main points of the declaration. Thomas Jefferson, who was part of the committee, was the one who wrote down the declaration, in its final draft, to be presented to Congress. The committee is standing before General Washington. Thomas Jefferson is handing the committee’s proposed draft over to Congress. 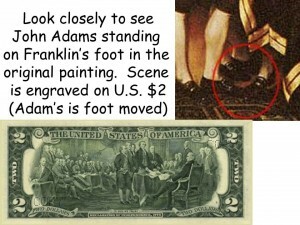 Benjamin Franklin stands to his left. 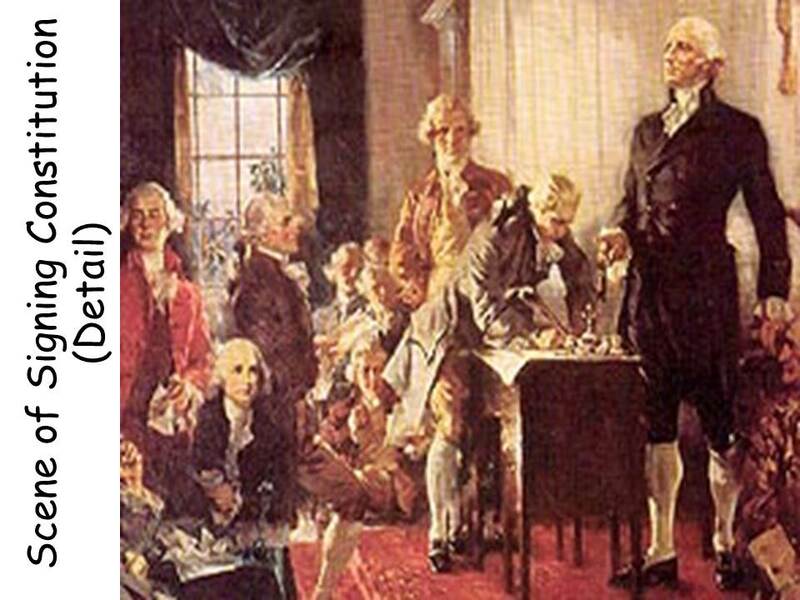 After the Declaration received a number of changes, the Second Continental Congress formally adopted it on July 4, 1776. This is now known as Independence Day or what we less formally call the 4th of July holiday. Now that the declaration was adopted, the Americans knew there was no turning back. They were going to have to fight for their freedom. The British army had to be driven away from American soil! Notice how the edges of the room are dark, or shadowed. A beam of light seems to come from above, in the right corner of the room, and slant towards the committee. This was John Trumbull’s way of stating that these men were doing what was good and right. He caused heaven’s light to shine on them. Look at the eyes of the other men in the room. Where do all of them seem to be looking or focusing? What is the focal point or CENTER OF INTEREST? Almost all of the men are focused to the middle of the painting (CENTER OF INTEREST), where Thomas Jefferson, Benjamin Franklin and the rest of the committee are standing. The men’s eyes, as well as the beam of light, lead the viewer’s eyes to the committee. Emanuel Gottlieb Leutze (Loyt-suh) was born in Germany in 1816 and immigrated to Philadelphia with his parents in 1825, when he was about 9 years old. 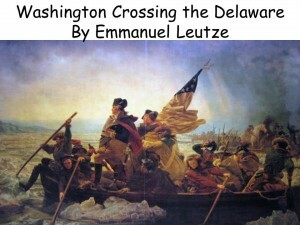 Leutze became an American citizen. He died in 1868 and is remembered mostly because of this painting. Seventy-five years after the event, Leutze made this enormous painting (approx. 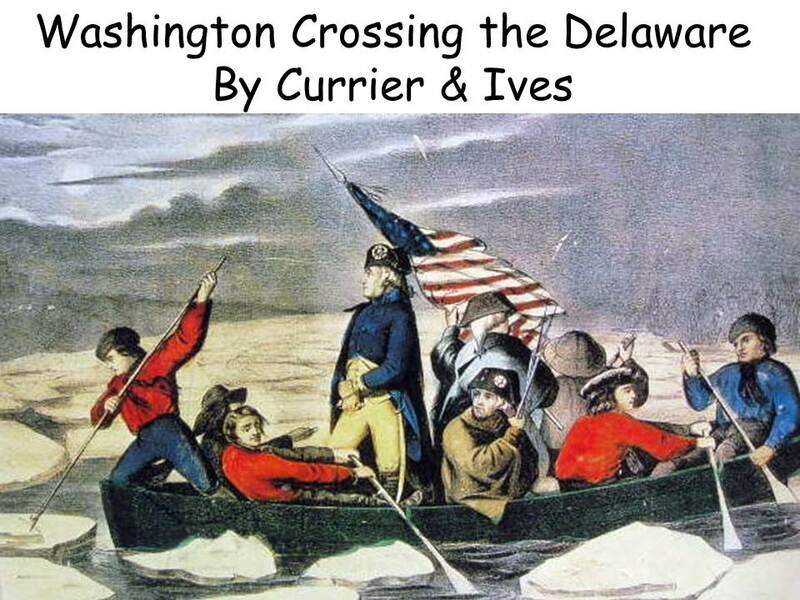 12 ½’ x 21’) of Washington crossing the Delaware River with his soldiers. Leutze never meant to create a historical document. He just wanted to capture the spirit and drama of an important time in America’s history. Leutze admired Washington and saw him as a symbol of liberty and freedom. Leutze painted this picture in Germany and it is interesting to note that the artist used Americans as models for all but one of the soldiers in the boat. This is a scene from a famous event that happened early in the Revolutionary War. In July of 1776, America began its battle for independence against England. By the Christmas of 1776, George Washington’s army was almost beaten by the British army. They were camped on the Pennsylvania bank of the Delaware River, just across from the town of Trenton, New Jersey. During the era of the Revolutionary war, it was traditional that wars were more or less called off during the winter months. Because of this, British General Howe had taken the main part of his army back to New York, to wait for spring. The General had, however, left small garrisons (or groups) of soldiers in several New Jersey towns. Trenton was one of these towns, and three regiments of “Hessian” soldiers were holding it. Does anyone know who the Hessians were? General Howe’s British army in America had 9,000 men that he had evacuated from Boston. However, he needed MORE men. King George hired 30,000, well trained German soldiers and shipped them to the colonies. Because most of these soldiers were from one German State, Hesse-Cassel, these soldiers were called “Hessians”. Washington decided to attack Trenton on Christmas night, 1776. He thought the attack would boost his army’s morale. Washington ordered every boat, for miles up and down the river, to assemble for the attack. He was taking a big risk. If his attack failed, Washington’s army would probably not make it back. Christmas night, in 1776, was bitterly cold. The Delaware River was dangerously filled with large, floating chunks of ice and the air was full of sleet. Washington’s men were only dressed in thin, summer clothes and most of them wore no boots. Many had their feet wrapped in rags for protection against the cold. These men left bloody tracks in the snow on the way to Trenton. Once across the Delaware River, the freezing, tired men faced a painful nine-mile march to Trenton. At daybreak, Washington’s men reached the outskirts of Trenton. The surprised Hessians were no match for the Americans. The battle lasted only one hour. There were no American casualties. The Hessian commander, Colonel Johann Rall, died from his wounds. This first real victory of the war brought strength and optimism to the American’s patriotic cause. Nine hundred and eighteen Hessians were captured as prisoners of war. Washington’s orders to treat the captives fairly resulted in many Hessians deciding to remain in America and become loyal American citizens. The gold color of the sky behind him lights up his face. The sun is beginning to rise and the edges of the picture are dark. The men in the boats are bundled up against the cold. They are close to land now; you can see it on the left of the painting. He stands as still as a statue with one foot forward. His high-booted feet are firmly planted in the boat and he doesn’t struggle to keep his balance. Look at the flag in the center of the picture. Washington is standing in the center also. Washington and the American flag are symbols of American Patriotism. They are the CENTER OF INTEREST or Focal Point. Do you think the man holding the flag would be safely standing there? Common sense says it was too dangerous. Notice the horses standing in the boat behind Washington. Do you think it would have been safe to cross that rough, icy water while seated on a horse? The artist has painted things in this picture that do not make sense, in order to create a feeling or MOOD. He wants us to feel the excitement of the moment, so he does not care if all the details of the picture make logical sense. The boats in the painting are not historically correct. Washington actually used long, hi-sided Durham boats. These boats were much larger and held about forty men. The horses and cannons were ferried across on rafts. Another historical inaccuracy involves the American flag. The Battle of Trenton was fought before Congress adopted the flag with Stars and Stripes on June 14, 1777. Out of respect for the flag, the men would have rolled it up and encased it, to keep it safe, instead of flying the flat on a stormy night. At about 3:00 AM, the Americans landed on the Trenton side of the river and charged into the town. Do you think the sun would have been this bright at this hour of the morning? Why did the artist paint the picture this way? So that we could see what was going on while Washington and his troops were crossing in the dark. Most of the Hessians had been up all night drinking wine and celebrating the Christmas holiday. Before they even realized it, the Hessians were surrounded. Their commander was killed and the entire garrison (about 1,000 men) was captured. It is interesting that Emanuel Leutze chose this event of the Revolutionary War as the subject of his painting. This was the first real victory for the Americans and it happened in 1776. How is Washington’s uniform different from the other soldiers? He looks important because he is dressed in a uniform of a commander. All of the other men are wearing assorted jackets and hats of their own. At this time, the Continental soldiers had no uniform. It was not until two years after this battle that regulation uniforms were provided for these soldiers. The oarsmen are soldiers from Marblehead, Massachusetts. These men were actually experienced fishermen and sailors, who volunteered to gather the boats and navigate the dangerous waters. The young soldier holding the flag is Colonel James Monroe, who later became the fifth President of the United States. The black man in the boat is Prince Whipple. He was born in Africa and was sent to America by his wealthy parents to be educated. Unfortunately, because he was black, Prince Whipple wound up being sold into slavery. His owner, General Whipple, arranged for him to become Washington’s bodyguard. After the war, Prince Whipple won his freedom. What is happening in the boat? A man in front uses a pole to fight off the floating ice. Several men clutch the icy oars and try to row. Two others struggle to keep the flag up. The man in the rear uses a rudder to steer. Each soldier turns in a different direction, focusing only on doing his job. The journey across the river is a tense battle between these men and the forces of nature. A Lithograph is a print of a drawing done on a smooth stone with a special crayon. A man named Aloys Senefelder discovered lithography one day, in 1796. When Aloys needed a piece of paper to draw on but did not have any nearby, he drew with a crayon on a piece of smooth limestone. He later noticed that water was repelled by the greasy marks that the crayon made. This observation made him curious enough to experiment with ink and eventually to create a print of what he had drawn on the limestone. James Merritt Ives was born in New York City, on March 5, 1824. He was an artist and created a Lithography firm of his own. Currier hired Ives as a bookkeeper in 1852 and made him partner in his printing company in 1857. Currier & Ives is the most famous American Firm of Lithographers, whose work is a pictorial record of American history and life. Their early Lithographs were printed in black and white and then hand colored (painted), much like a coloring book print. Lithographers draw their pictures on a stone with a greasy pencil or special crayon. Next, the image is “fixed” on the stone with diluted acid and gum arabic. Water is then applied to the stone. The greasy marks drawn on the stone repel the water. Once the stone is wet, greasy ink is rolled on it. The wet surface of the stone repels the ink. The dry, greasy marks from the special crayon (or pencil) combine with the ink. When paper is laid down on the stone and run through a press, the picture is transferred to the paper. A print is made. The same stone can be used to make many lithographic prints. This made it possible for an artist’s picture to be reproduced repeatedly, quickly and inexpensively. Every picture was the same print. Lithography was used to make cards, labels, product packaging, book illustrations and posters—things that needed to be reproduced in quantities. Metal smiths probably invented the art of engraving. During the Renaissance, Metal smiths made carvings on copper, bronze, iron, and silver. Probably one of these Metal smiths had the idea of coating his engraving with ink and making a print on paper, to see how it looked. From that action, someone else got the idea of engraving a picture in copper for the sole purpose of making a print. The painter Albrecht Durer became a master engraver. He was famous all over Europe for his detailed engraving. Burins are the engraver’s drawing tools. Placing the mushroom-shaped handle of the burin in his palm, the engraver exerts pressure and the ultra sharp tip removes precise amounts of metal. Pushing the burin along, a small curl of copper is removed and a line is carved. The edges of this line are smooth, so when they are inked, they will make a print that is sharp and clear. The American painter and illustrator, Howard Chandler Christy, was born in Morgan County, Ohio, on January 10, 1873. After high school, in 1893, Christy went to New York to study art. He soon decided to become an illustrator. Christy went to Cuba, during the Spanish American War, and drew pictures of Theodore Roosevelt’s “Rough Riders” in action, as a magazine illustrator. His illustrations appeared in Harper’s and Scribner’s magazines and in Collier’s Weekly. Christy died March 3, 1952. This painting is located in the nation’s Capital, in Washington D.C.
On October 17, 1781, the English surrendered and the Revolutionary War ended. A new country, The United States of America, was born. The British colonies were states now. The states were united into one country, but there was a problem. No state did what was best for the WHOLE country. Each state did what was best for itself. Congress could not get the states to work together. In May of 1787, Washington and some other Statesmen met in Philadelphia. They came to figure out a new way to govern their country that would help EVERYONE. For many months, these statesmen worked hard to make a new plan for the government. They called their plan the Constitution of the United States of America. 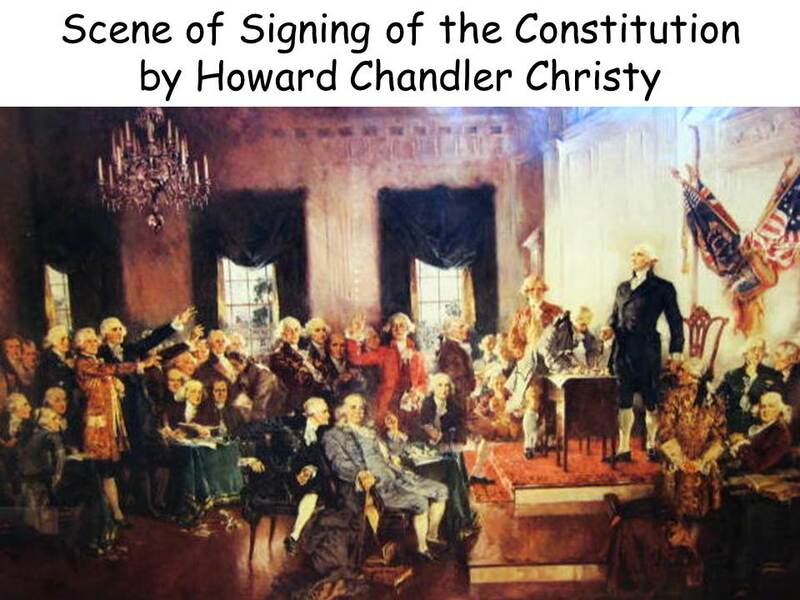 The representatives from each of the states had to sign it, symbolizing that they all agreed with what it said. This Statesman had many wise suggestions for writing the American Constitution. Franklin was good at finding compromises when the states could not agree on different points. Franklin is wearing lighter clothing and his face seems to stand out more than the other men, as if light were shining on it. Christy has used the same effect of light—heaven’s light—which John Trumbull used. The artist has made George Washington, who is standing on the platform to the right, and Benjamin Franklin the only two men in the room that the viewers really focus on. The viewer’s eyes travel to these two men first and then around the rest of the room. The artist has made sure that the viewers understand that these are the most important historical figures in this scene by making them the CENTER OF INTEREST. Why do you think the artist has painted so much light around George Washington? These Statesmen generally believed that George Washington was divinely destined to lead this country. The artist has reflected this idea by using the light around George. Washington is also the most important figure in the picture because Benjamin Franklin’s face only reflects the light that is brightly originating around Washington. 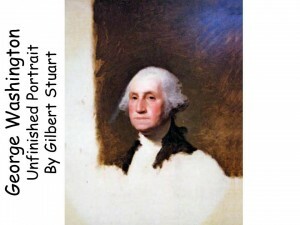 Gilbert Stuart was born in 1755. He was an American, born in Rhode Island, when this state was still a colony. Stuart studied portrait painting in England and later in Ireland. He returned to America, from Ireland, to paint a portrait of George Washington. Stuart was an artist very much in demand and he painted more than 1,000 portraits in his lifetime. His works include portraits of the next five U.S. Presidents following George Washington. In his day, Gilbert Stuart was recognized all over the world as America’s finest portrait painter. 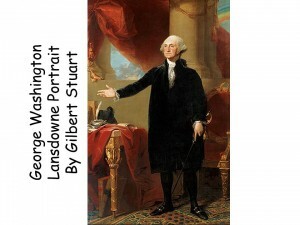 Gilbert Stuart created a standard image of George Washington that every artist since has copied. If George Washington ever came back to earth, he would have to resemble Stuart’s portraits or no one would ever recognize him. 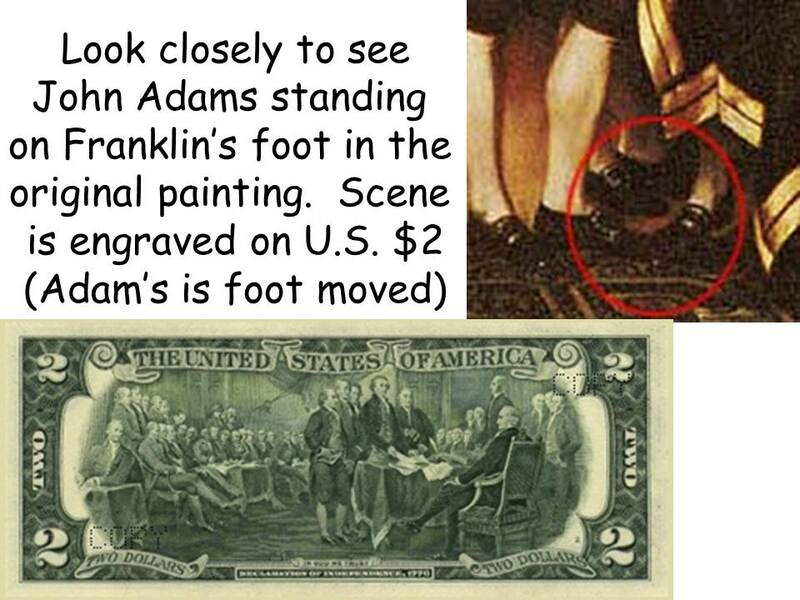 The $1 bill is an engraving of George Washington. This Gilbert Stuart portrait was the likeness of George chosen for the dollar. This was Stuart’s first portrait of George Washington. At the time of this painting, Washington was 63 years old. He posed for Stuart wearing a new set of false teeth that made his bottom lip stick out. Of course, Stuart was too professional to paint the President’s face that way. Washington was not an easy subject to paint. He never smiled. This was because of uncomfortable and ill-fitting false teeth. It was said that he had a good sense of humor and that he was friendly, courteous and cheerful. It was also said that Washington’s facial expression, in its quiet state, was serious, calm and kind. 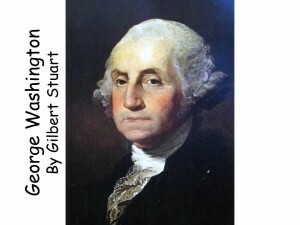 Stuart was able to capture the character of George Washington with his plain and realistic painting style. He painted Washington as a citizen president. That means Washington was dressed as a normal, gentleman citizen of his country would have dressed, in those days. He is not wearing a uniform, crown, or flashy clothes. His clothing is so plain and dark that it blends in with the painting’s background. • Sketch or paint a portrait of yourself, someone you know, or a make believe person. • Create a portrait with cut paper. Cut a face from a flesh shade of paper. Cut out the details—eyes, eyebrows, hair and lips—from paper too. Don’t draw anything, just use cut colored paper. 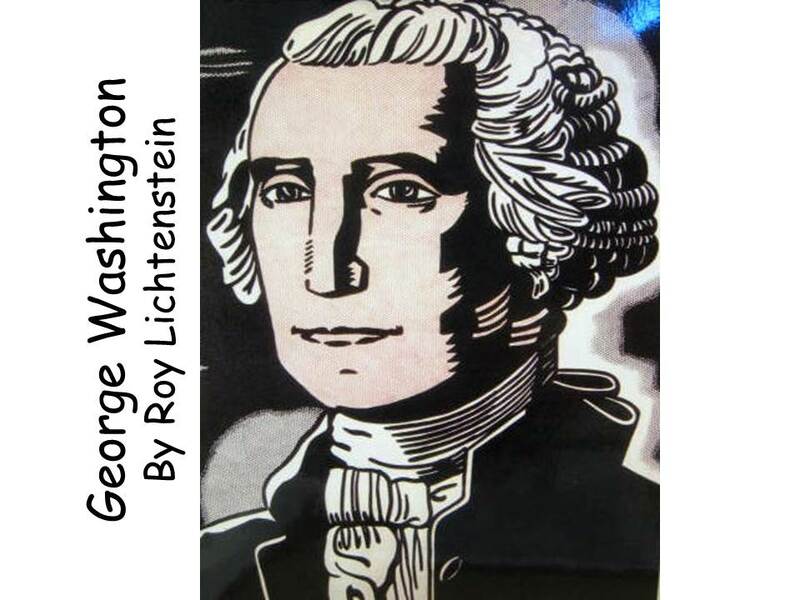 • Paint or color the face of George Washington inside the outline drawing. George Washington was an extremely admired man n his day. Pictures of the Presidents were popular and many naïve, or folk, artists (artists with no formal schooling or training) painted and sold them to people to hang up in their homes. • Create a Folk Art painting of George Washington. The above definition of a folk artist fits every student in your school. 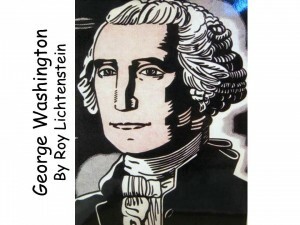 It will be interesting to see the many versions of George Washington that will be created by so many artists! This tight-lipped, dignified-looking gentleman is, of course, the first President of the United States, George Washington. Next to the images of him on dollar bills and on quarters, this is the most famous picture of President Washington. Martha Washington hired Gilbert Stuart to paint this portrait of her husband. Its Stuart’s third and last portrait of the president, painted a year before Washington left office. The portrait shown here was never finished either because Martha was not satisfied with it or because Stuart liked it too much to finish it and give it to her. Even unfinished, the painting was a great success. People loved pictures of the President, so Stuart painted more than 70 replicas of this “unfinished” work. He sold the copies for $100 each, so he called them his “hundred-dollar bills”. One story tells how even Washington agreed to take a copy of this original, which Stuart painted for him, instead of the original. Stuart painted more than 1,000 portraits, including six Presidents. His skillful way of capturing what was special about a person became the model that other American portrait painters followed. There were no cameras in George’s days. Because they are the finest paintings and show a man of dignity and power, we think of Gilbert Stuart’s paintings as the only true likeness—yet, Stuart did not know Washington very well and he left out things that we know were there. For instance, Washington’s face was scarred from smallpox and he had a mole under his ear, both things that Stuart’s paintings do not display. • Pair up the kids to write word descriptions, a WORD PICTURE, of each other (like General Mercer). Make a list of creative adjectives with the class. Include descriptions of the eyes, nose, mouth, hair, skin shade, and personality traits of the person. Offer an award for the best descriptions. Read some of the best descriptions aloud. 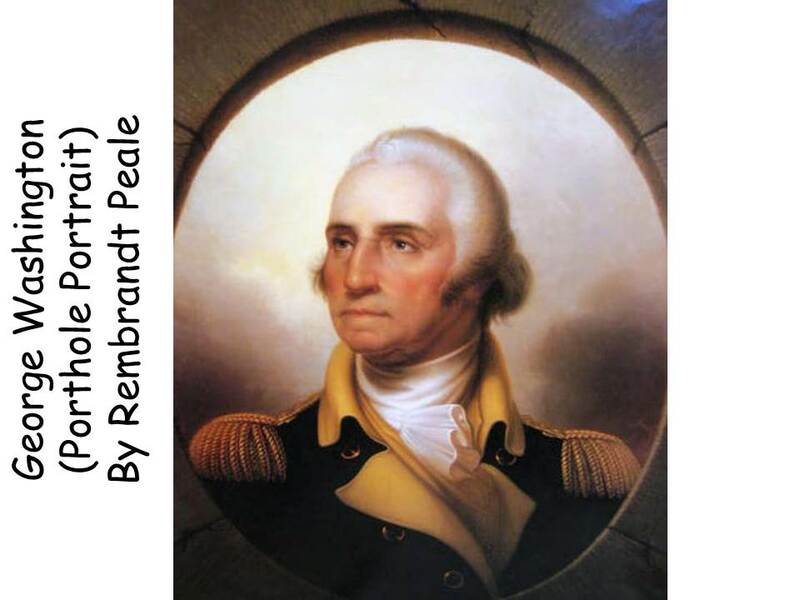 • Draw a picture of George Washington camped in the cold, snowy weather of Valley Forge. • Draw a picture of George and Martha, with their two children, in front of their Mt. Vernon home. 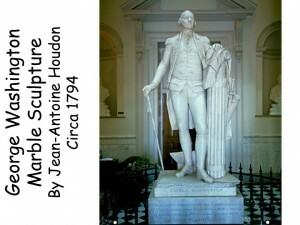 • Sculpt a version of the Washington Monument, in Washington D. C., from clay or paper maché. 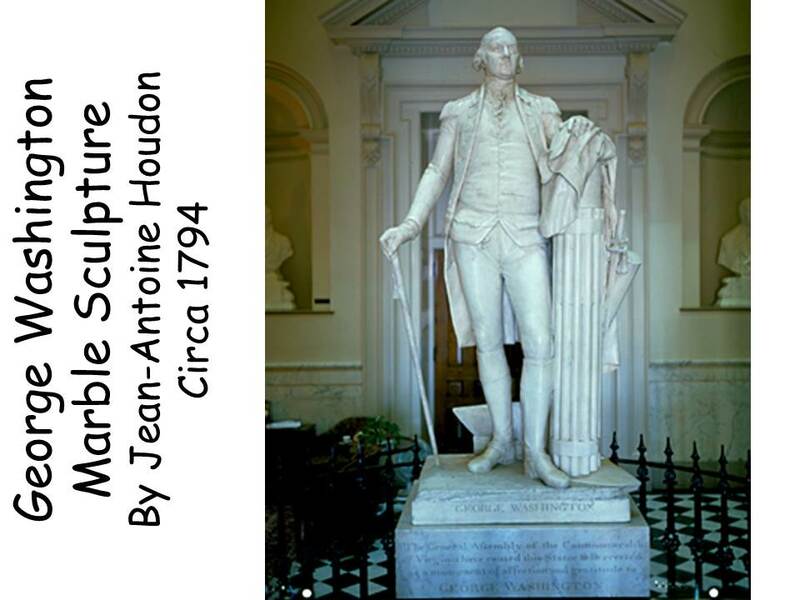 • Create a paper maché or clay BUST (full found sculpture of head and shoulders) of George. • Use green construction paper and design a new dollar bill with your own version of George’s portrait. Roughly sketch your design on plain paper before you put the final version on the green paper. Make the money look different by rearranging, adding or leaving out things that are on the bill we have now. Try adding a little color to make it look different also. In April of 1796, Mr. and Mrs. William Bingham talked Washington into posing for this portrait, which was painted by Gilbert Stuart. It was painted as a gift for the British Lord Lansdowne. The Lansdowne Washington was far from a masterpiece. Stuart painted it only because he was offered a good sum of money. He really felt that a full-length portrait of this type was a silly and frivolous type of painting. However, a full-length portrait (with a little corny pomp and circumstance) was what the Binghams had paid Stuart to paint. Combining his memory of pictures that Stuart despised, with imported engravings, which he thought of as trash, Stuart worked out a background composition containing an extremely over-elegant chair, bearing the seal of the United States. He also included the heavily carved leg of an even more elegant table, beautifully bound books, three fat marble columns, a completely unimportant mulberry curtain, with gold cords, and a sunset sky decorated with a rainbow. Stuart contracted many of the BACKGROUND details, which struck him as so silly, to a sign painter and naïve portraitist (folk artist) named Jeremiah Paul. The BACKGROUND of this painting takes up at least half of the canvas. Jeremiah Paul painted the background and Gilbert Stuart painted Washington. Although there were two artists who worked on this painting, only Gilbert Stuart is given credit for it (probably much to his embarrassment—he only did it for the money). Washington posed for this picture wearing a set of false teeth that pulled the lower part of his face out of shape. Stuart was bothered by Washington’s distorted mouth in this picture. It was probably very irritating to Stuart the way the false teeth changed Washington’s mouth, yet he painted the distorted mouth, just as he saw it. No one is sure why Stuart would do this except that, maybe, he just didn’t care that much for the type of painting it was in the first place. Stuart had a hard time trying to make George look somewhat heroic in this picture. He complained that Washington’s shoulders were too high and narrow and that his feet and hands were too large. Stuart just felt Washington’s body was too out of proportion to make a heroic full-length portrait that he could be proud of painting. This portrait hangs in the East Room of the White House today. It is the only remaining object from the mansion’s earliest occupancy, in 1800. During the War of 1812, 14,000 British soldiers surged into Washington, D.C., burning as they went. While President Madison was out surveying the situation, the British soldiers torched the White House, leaving only a smoldering shell of the mansion. Dolly Madison, who was First Lady at the time, rescued the painting from the burning White House. Is this a REALISTIC or EXPRESSIONISTIC portrait of George Washington? EXPRESSIONISM is a style of art where the artist is more concerned with creating a MOOD or feeling. In EXPRESSIONISM, an artist might change aspects of the art, such as COLOR or SHAPE, to create a certain MOOD. REALISM closely resembles nature. Lichtenstein was trying to create a portrait that resembled a comic book. The portrait is realistic enough for us to recognize who it is but the artist has changed the portrait to create a MOOD for the viewer. This EXPRESSIONISTIC portrait is created in Lichtenstein’s style, using his signature Benday Dots to color the face. What kind of MOOD do you think Lichtenstein wanted to create for the viewer? Answers might include silly, sarcastic, fun, surprising, goofy, comical, etc. Does this picture make you smile?  Look at clippings from colored comic books. Pass a colored comic section out to each of the kids, or groups of kids. Have them look closely at the colored areas of the comic to see the small “dots” printed closely together that fill in these colored areas. Explain that the dots the kids see are called “Benday Dots”. They are an inexpensive way to color printed pages, like comic books. This printing process was invented by Benjamin Day and was named after him. Dots of primary color and black are printed close together to create large areas of color. When a secondary color (like green) needs to be printed, dots of blue and yellow overlap each other. When we move the comic picture away from our eyes a little, our eyes automatically mix the two colors of the dots together, and we can see green. Notice how some dots are smaller and some are larger. Different combinations of the sizes of the colored dots can create various COLOR VALUES (lighter or darker). Roy Lichtenstein created a style of art, called “Pop Art”, using the idea of Benday Dots. He painted very large pictures that exaggerated these printing dots and made people look twice at the picture. This unusual way of painting is also interesting and unexpected. Pop artists liked to do things with their artwork that made people think or look again at their work. They also felt that art should be fun. Where do you find Benday dots? Coloring George’s face and in areas of the background. • Create an EXPRESSIONISTIC portrait of some historical character (possibly someone you have been learning about this year) and color it with marking pens, using thick outlines and Benday Dots, similar to Lichtenstein’s style of painting. The hole punch of a piece of notebook paper will work as a template to lightly trace circles in selected areas of the picture, once it is drawn. Once the circles have been traced, they can then be colored in or painted. The hardest part of a Pop Art Benday Dot project is taking care to create a PATTERN with the dots! If you look closely, Lichtenstein’s dots are not random, but carefully placed. Hole punch dots are a good size to work with, as they are not as small as the ones in the Washington portrait but will still create a satisfying look when carefully placed to fill up the space. USE BENDAY DOTS IN AT LEAST TWO AREAS OF THE PORTRAIT! Grant Wood was born on a farm near the small town of Anamosa, Iowa, on February 13, 1891. This artist became famous by painting simple scenes of the land and people he knew best, mid-western Americans. His paintings show the love he had for the people and customs of this area of the United States. Grant showed an interest in art at a young age. He often drew pictures using burnt sticks his mother gave him from the wood stove she cooked on. Grant was a farm boy who had his own goats, chickens, ducks and turkeys and he enjoyed taking care of them. Although Grant drew wonderful pictures as a boy, everyone was sure he would eventually grow up to be a farmer, just like his father. When Grant was only ten, his father died. The farm was too much for his mother to take care of so she sold it and moved Grant, his sister, Nan, and brother, Frank, to the nearby city of Cedar Rapids, Iowa. It was hard for Grant to go to school in the new city at first. He missed the farm and some of the kids at the new school made fun of him. He had a good sense of humor though, and was talented at drawing. This helped him eventually fit in. When he was 14, Grant won third prize in a national contest for a crayon drawing of oak leaves. He said that winning that prize was his inspiration to become an artist. In high school, Grant had many friends. He loved designing scenery for the high school plays, along with drawing pictures for the school paper and the yearbook. When Grant Wood grew up, he went to art school and then traveled to Europe to study paintings of the great masters of art. Eventually, this artist made his boyhood memories of Iowa the themes for his paintings and created a style of painting all his own. Grant once said that he had to go all the way to France to be able to appreciate his native Iowa. Grant’s rural country scenes and landscapes are full of PATTERNS, GEOMETRIC SHAPES, clean, smooth surfaces and extremely orderly details. He wanted to make his decorative style paintings a modern type of art, as well as a view of mid-western America. Wood died in 1942, at only 50 years old. The story this painting tells is a well-known fable. 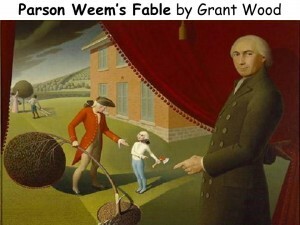 In 1800, a man named Parson Weems wrote a book about George Washington. In the book, Washington confesses to chopping down a cherry tree and (according to Parson Weems) tells his father, “I cannot tell a lie.” Although this story is not true, it has become a very popular and well-known American fable. Who are the characters in this painting? In the left background are a female and a male slave. Washington’s father, as well as Washington himself, owned slaves. The man in the red coat, in the MIDDLE GROUND, is apparently Washington’s father. The boy with the ax is George. The larger man in the FOREGROUND, pulling back the curtain and showing us the scene of the story he originated, is Parson Weems. How do we know for sure that the boy is George Washington? Wood has copied a famous portrait of Washington as president for the boy’s head. Compare George Washington by Gilbert Stuart to the boy’s face. Does the portrait face of the “tree chopping boy” look similar? What are the characters in the BACKGROUND doing? The black woman is holding a basket and picking cherries. The black man is holding a ladder, getting ready to help her pick the cherries higher up on the tree. What are the characters in the MIDDLE GROUND doing? The man in the red coat is holding the damaged cherry tree in one hand and holding out the other hand towards George, who is pointing to the ax in his other hand. What is happening in the area closest to the viewer (FOREGROUND)? Parson Weems is pointing to the confession scene. The viewer is not meant to take the parson seriously. The artist has painted the parson with a knowing gleam in his eye. Notice how the formal curtain dangles silly “cherry” pompoms. What do you notice about the size of the figures (people)? Which figures are the smallest? Why? By getting progressively smaller, the illusion of distance is created. Smaller figures look father away; a large figure of Parson Weems OVERLAPS other elements of the picture and looks closest to us. Artworks can show characters in a setting just as stories in a book can. Artists may show only one event but viewers can imagine a whole story when they are inspired by the artist’s scene. What other story do you think Wood was trying to tell the viewer? Maybe Wood was painting about how ridicules myths grow up around public figures. Focus on how Wood’s use of space in the picture creates a story within the story. Additional answers should be supported by what kids see in the picture. The artist has placed him in the center. Parson Weems and George’s father are both pointing towards him. Other lines in the picture point towards him. The lightest area of the picture is also here, centered between two areas of the brightest COLOR. George is centered between the red coat of his father and the red of the hatchet blade. • (Grades 3-5) Choose a character from a familiar American fable or folk tale, or a real historic character, to illustrate in a drawing or painting. Brainstorm a list of these characters and stories with the class and write them on the board at the front of the room. 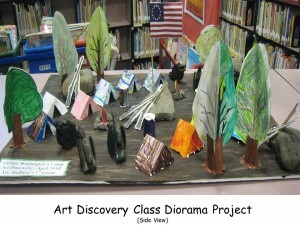 A few to get you started: Paul Bunyan, Johnny Appleseed, Abraham Lincoln, Lewis and Clark, etc. Explain that the scene needs to clearly tell a story. Consider which setting, characters and objects will best tell the story you are creating. Pretend like the viewer has never heard the story before. Your drawing needs to include enough details that the scene tells a complete story without using any words. Spread out the objects you draw to tell the story into different areas of your scene (foreground, middle ground and background). This will help you have enough space to tell the story. Remember that size, location and color affect where the viewer sees an object in your scene. • The famous story of George and the cherry is known to be folklore (not real). Folklore is still fun to share, because of its tradition. Illustrate your version of young George’s tale. Raised in the long shadows of his accomplished artist-father, Charles Willson Peale, and the heroes and statesmen whose portraits lined the walls of his father’s gallery, Rembrandt was, in a sense, surrounded by the achievements of past masters. The challenge to distinguish himself as an artist was compounded by a lack of public interest in the arts, his poor business skills, and his desire to depart from the well-trodden path of portrait painting. However, it was as a portraitist that Peale was able to support his large family and combine his high-minded, nationalist ideals with an art that appealed to a large audience. Having first painted George Washington in 1795, and having won acclaim for his Patriae Pater (1824, Collection of the United States Senate, Washington, D.C.), Rembrandt stated in the 1850s that his true calling was “to multiply the Countenance of Washington. By his death in 1860 he had done so no less than seventy-nine times, systematically producing simplified versions of the Patriae Pater that became known as the “porthole portraits”. Emphasizing the fact that he had painted Washington from life, Rembrandt supported his claim by soliciting testimonials from other men who knew Washington personally and could confirm the accuracy of his portrait. He sought to distinguish himself from other artists who had painted the first president from life and at last to match the accomplishments of his father, whom he acknowledged as having painted “the first portrait of Washington in 1772”. Rembrandt’s insistence on the importance of his direct contact with Washington is ironic. With his subject long dead, his Patriae Pater and the subsequent porthole portraits were actually composites of his 1795 portrait and others he had admired, such as the famous bust by the French sculptor Jean-Antoine Houdon. Nevertheless, his enterprise was a success, coming at a time of renewed interest in Washington as a national hero. The importance of Rembrandt Peale’s icon making to the evolution of American culture has been confirmed most recently in the potency of 1960s Pop Art images, and by that movement’s revelation of our society’s ongoing interest in icon creation.